I started this thread to focus solely on Magic: The Gathering as opposed to the general card games thread that exists. :3 For all you fans out there, we can discuss deck building strategies and/or your favorite decks or even the story behind the worlds of the game. I am currently working on modifying one deck for each of the guilds in the Ravnica Plane. Last edited by lightwolf21 on Fri Mar 22, 2013 10:06 am, edited 2 times in total. Awww, you just reminded me that I've never got play Magic: The Gathering, and back when I still was following the news about the game (2005 and the release of "champions of Kamigawa", man I can't belive I still remember the name of that expansion!) I didn't know how to read or speak english! Trying to find a book that told me the backstory and lore of the game in spanish was fruitless. Hey! What if the planeswalkers and all their minions went to the housepets! universe?! That would be a very interesting concept. I actually made a few cards using the art from some comics. XD It was funny. I'll try to upload them later if I still have them. Remembering there are already god-like mystical beings "in" the Housepets Universe...probably wouldn't change much. lolz. While I haven't bought new cards since like 2011 I still whole heartedly approve of this topic. I need to find people to play magic with on campus I miss it. I fangirl about Magic so hard. I approve of this topic entirely. Anyone wanna see my decks? They're all listed here. That links to my entire collection, but on the left you can see my seventeen decks. I can answer virtually any question anyone might have about the game, strategy, cards, and to a lesser extent story. Glad to be of service! My friends played in middle school around the time Legions came out up until the release of Champions of Kamigawa. I watched them play but my mom never let me play myself, so I didn't have any cards to play with. But I was instantly in love. When Zendikar was out, some of my friends decided to start playing again, and this time I joined with them (without telling my mom at first). Some of my friends stopped playing, others started, and I've been playing since. I stepped up how much I played around the time Scars of Mirrodin came out, and then once more when Avacyn Restored came out. I mostly play Draft and Commander, although I love just about every format there is. I started buying this stuff since its debut, and went all the way to 'Mirage', until I had to stop due to ecnomical reason...and never got to start again. I am keeping myself busy with Magic WorkStation, so to keep track of the existing cards. As many of you might have heard, Cockatrice shut down their website due to Wizards' meddling. It was a great way of playtesting decks and I didn't buy any less Magic cards because of it. I think it was a bad decision on Wizards' part but at least I have friends here locally to play. I have been considering getting Duels of the Planeswalkers for Steam. Anyone play this? What's your opinion on it? I always thought magic video games were kinda lame and not really a good substitute for actually playing. Then again I always enjoyed the social aspect of the game a lot more than the actual game so my opinion may be moot here. I can see the appeal of that. I also prefer playing with actual cards because I have a much bigger pool of cards to choose from when I'm building decks. 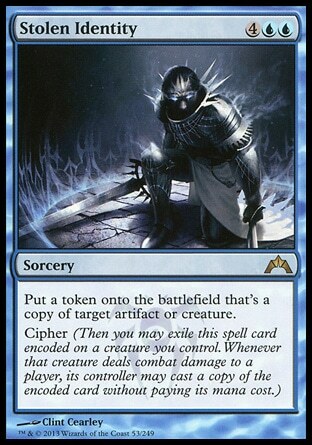 speaking of doees anyone know of any cards that have an effect similar to Ensnaring Bridge? 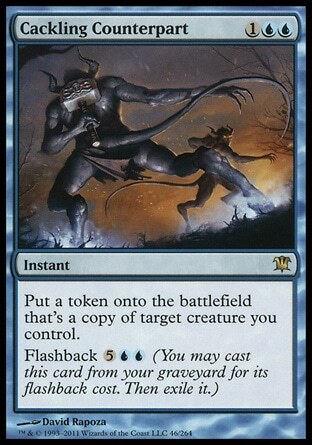 I use it in a burn deck to shut down agro decks and allow me to ignore creatures and just throw all my burn spells directly at players. 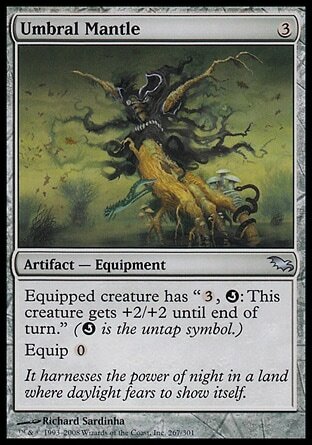 But I kind of want to find another card with a similar effect so I can shut agro decks down more consistently. Are there Magic: the Gathering videogames that aren't a card playing simulation? Form of the Dragon might help. Also consider using cards that increase your total max hand size and draw-a-card cards. I got about 3 decks currently, one is with cats, the other self killing. But I have my favorites, my elven deck. AKA, put half the creatures from your deck into play. That's just mean. My elf deck is pretty much "play a bunch of good elves, many of which give your other elves +1/+1." And Descendants' Path is always a fun part of an elf deck. Also, Duels of the Planeswalkers is actually really, really good as a primer. It's also a fun diversion for people who already play. It's more or less the full rules (with a few exceptions), and you can play some neat challenges. Do you still have your cards? Anything valuable? Cockatrice was shut down because it was letting people play the equivalent of Magic Online (a product/service Wizards provides) for free by violating Wizards' copyright. It wasn't playtesting that they were worried about. It was people using at a substitute for real Magic. Running anything but tokenspam/wellwisher in an elf deck is just blasphemy. What about one based on Glimpse of Nature? 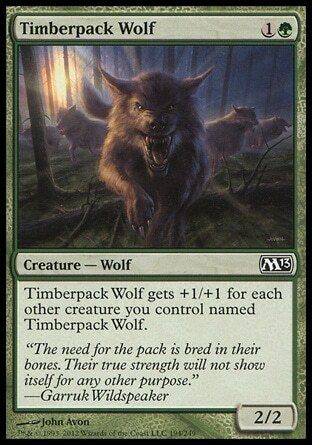 Ok, kinda lame but fun because it will power up your wolves for cheap AND it uses a card from "Unhinged"
Or you could use other options. I remember this. I had a few decks. 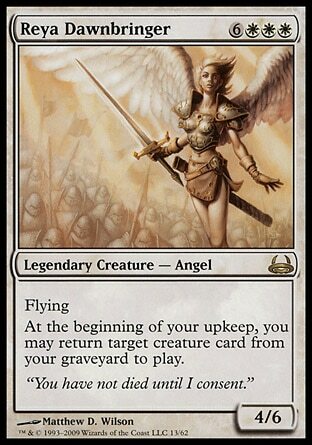 I even had an elegendary angel card 4/6 that had the power to ressurect a creature per turn (but it was quite costy to summon since it needed 3 white terrains and 6 common). I sold it to a friend for one dollar. I would say I highly regret this decision, but I was just 12 at the time and, now, I lost all my cards (I lent my cousins all my decks and cards for them to play once and they ended up loosing the cards). Here's the deck I'm bringing to FNM tomorrow! Ooh that looks fun. But have you looked into playing some Avacyn's Pilgrims or Arbor Elves? You don't really have anything to do turn 1 and it's really a boon to get a Loxodon Smiter or Silverblade Paladin out turn 2. 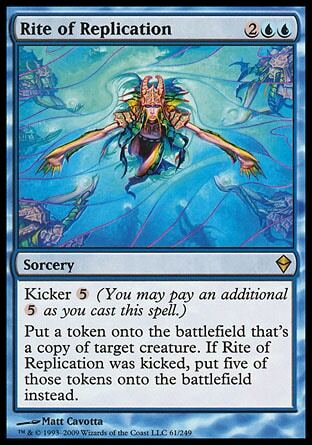 Also Prime Speaker Zegana might be worth looking into in a deck like that. Possibly even over Sphinx's Revelation. I, personally, consider your choice of Feeling of Dread a bit suspect, if you're looking for my first suggestion of what to cut. I have one of her! @sleet: Yeah, that's the one. I kinda miss her. I kinda miss some of my cards and decks, but not that much since I don't have anyone to play with me and there's no tornaments in my town or near it for the matter (that I know of at least). I've herad there are ways of playing online with cards you buy online, but it's not that fun to not have the actual phisical card. As for my cousins, that was a long time ago. I was kinda mad at the beggining, but I ended up forgiving them. But I do remember a few cards. I think the translation to one of them was "Turtle's mantle, which gave +2/+2 an hability that allowed extra damage delt against a creature to be dealt against the player life points (don't know its name in English, sorry) and also the power to earn life points equal to the damage I dealt. I had three of those cards, but a guy in my school said to me that it was bad to have multiple equal cards in the same deck, so I exchanged 2 of them for kinda average cards. Now I feel scammed. I was a big newbie/noob when I was a kid at this game. I only learned how to actual play this game when I was 14~16. Last edited by angelusbr on Fri Mar 29, 2013 7:21 pm, edited 2 times in total. That card is called Armadillo Cloak. 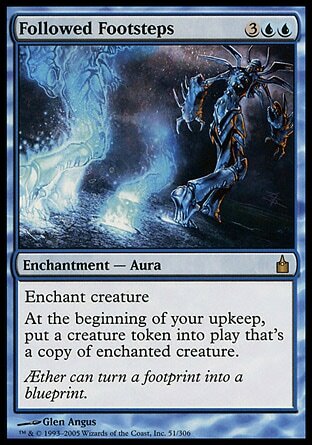 It's one of the best creature auras ever printed. Or at least it was; creature auras have always been pretty bad so to make them more attractive to players their power has been pumped up a little. So that's its name in English. It's hard to talk about cards when the name translation is tricky. Oh, well, Did you ever used a terrain card called something like "temple of the false god" that works something like this: it grants 2 common terrains once you have 5 terrains on your side? I had THREE of these in my deck (the limit of the same card in the same deck is three, isn't it? It has been years since I played). Let's just say, whenever I got to play with someone and I spammed this card...I was a charming son of a young woman. Two of my friends play with Temple of the False God. To use the technical English wording, it's a land card that taps for two colorless mana, only if you control five or more lands. The maximum is actually four. And that card is pretty neat. It's like Pacifism but for less mana and with a threshold required to get the full effect. And it has a bird on it! .....i just wanted to put this out here. That happens sometimes. Just make sure to shuffle well enough that your lands don't all get clumped together in your deck and mana drought (sometimes more crudely called mana screw) is less likely. Or what do you mean "random decks"? Did you just throw together a bunch of cards, or did you use preconstructed decks? If you didn't have a good ratio of lands and spells that might have been your problem. just for fun we shuffled all the cards (120) and dived it between us with out looking. Yeah if those decks are different colors, that's a bad idea. Playing three or four colors without fixing (fixing refers to cards that make it easier to play multiple colors, whether that means tapping for multiple colors or letting you search your library for a land) is a recipe for not drawing the lands you need. If you want to keep playing I recommend splitting the decks up again. I've always wanted to learn how to play MtG, since I played Pokemon and YuGiOh a lot in high school. But the sets are soooo expensive here, I'd probably be penniless before I get a set. Then, I got the online version in Steam last month, only to learn my 6-years-old laptop is too old for it. Oh, the humanity..
Aww. Are there any online retailers that sell for a decent price and deliver to where you are? Yes. They are on my deckbox.org account under the guild names and v.2. MOD EDIT: Please don't discuss illegal activities here. It seems odd that some of the guilds have more rares than others. And that you use less than 4 guildgates. I take it you don't have more? Also, FYI, Wild Beastmaster is flavorfully a Gruul card, not a Golgari card. Even if it has a lot of synergy with Golgari. They look good though! A nice introduction. Wild Beastmaster could be a Gruul card but it was one of the two rares included in the Golgari Intro pack. ._. I can't wait to let my friends play these decks against one another and/or myself. Green X's indicate completed guild decks. Having only four lands that enter tapped is not really a huge problem, for the most part. Ideally you'd want more useful lands like shocklands or checklands, but those are obviously out of budget. And Wild Beastmaster is, without a doubt, a member of the Gruul Clans. I'm not saying it's off-limits or anything, I'm just saying it might be worth reconsidering if you really want to stick to a flavorful theme. I do have some shock lands but in play testing I don't usually have a problem with lands...and I see that Wild Beastmaster would be essential for a Gruul Deck. I have very few cards on the sideboard for some of my decks on deckbox but I'm unsure which cards to replace with them.